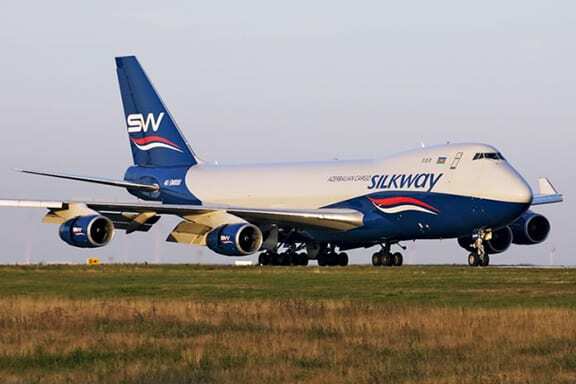 Silk Way Airlines Addresses "Deliberate Misinformation Campaign"
Silk Way Airlines is an Azerbaijani private cargo airline with its head office and flight operations at Heydar Aliyev International Airport in Baku, Azerbaijan. It operates freight services linking Europe and Asia, United States and Africa, as well as services for government and non-governmental organizations. Last year, Harut Sassounian wrote an article for Asbarez News reporting that the Silk Way Airlines of Azerbaijan made 350 secret flights to transport hundreds of tons of weapons from Bulgaria to ISIS terrorists in Syria and other Middle Eastern countries between 2014 and 2017. The disclosure was made by a reporter for the Organized Crime and Corruption Reporting Project (OCCRP) by filing a Freedom of Information Act (FOIA) request with the U.S. government in 2016. It is noteworthy that Silk Way, “owned by a company with past ties to Azerbaijan’s Aliyev family, won some lucrative contracts from the U.S. military,” according to FOIA documents. We now have a new surprising revelation that Silk Way received $419.5 million of loans from the U.S. Export-Import Bank (EXIM) to buy three 747-8 cargo planes from Boeing to continue its sinister operations. Silk Way Airlines (“Silk Way”) strongly refutes the recent false claims put forward in several online articles attempting to smear Silk Way’s trusted reputation. Void of any merit, these articles are a result of an organized campaign of misinformation penned by geopolitically motivated authors perpetrated to be in direct collaboration with Armenian connections. Contrary to the false claims made in the articles, Silk Way dutifully followed all applicable protocols and methods under national and international aviation regulations and legal provisions concerning the transportation of goods by air, including International Air Transport Association (IATA) and International Civil Aviation Organization (ICAO) standards. As a standard operating procedure, prior to conducting the flights in question, Silk Way always obtained, without any diplomatic immunities, all necessary permits and exemptions required to transport dangerous cargo. In addition, so-called ‘secret flights’, published in the articles referred, besides their fictitious quantity, were operated in full compliance with all established procedures and were ordered by the United States Department of Defense (DoD), while all consignors and consignees were designated by the mentioned authority. Thereby, the statements questioning the nature of these flights and their consignors and consignees lack all legal or substantive elements. On the contrary, Silk Way’s proper handling of this cargo has been confirmed by multiple authorities, which have since publicly refuted the false claims of misconduct in official statements, one of them made available here. The very same authors who attempt to describe Silk Way as a company involved in illegal activities, admit in their posts that high-ranking institutions such as the U.S. military including U.S. Transport Command, Boeing and Boeing Global Services, the Canadian Department of National Defense, the German Armed Forces, the French Army and the United Nations, have a long-standing contractual relationship with Silk Way. These partnerships reaffirm the outstanding reputation of our airline and are a testament to Silk Way’s commitment to quality services, safety, reliability, and corporate compliance. Having failed to substantiate its claims of illegal flights, the misinformation campaign then engaged in a libelous character assault on Silk Way Group President, Mr. Zaur Akhundov and questioned the financing of Silk Way’s fleet expansion. The articles fabricated information about Mr. Akhundov’s professional credentials and experience, attempting to portray him as an unknown ‘mystery man’ who took control of the Silk Way brand. In truth, however, Mr. Akhundov was critical to the founding of Silk Way, has been a leader of the Silk Way team from the beginning, and brings decades of valuable experience in developing the aviation industry in Azerbaijan. Mr. Akhundov has no ties to any government or political party. Concerning the allegations related to the financing of Silk Way’s fleet expansion, our airline has cooperated transparently and as a result has built trusted partnership with many well-known international financing institutions, including notably, the Export-Import (Ex-Im) Bank of the United States. The Ex-Im Bank is a federal agency with the primary policy of supporting the acquisition of U.S.-made products such as Boeing aircraft. Before Silk Way legally obtained loans at the prevailing market rate which were backed by the Ex-Im Bank, the airline successfully passed all steps of compliance procedure, including due diligence reviews by the U.S. government. Furthermore, the guarantee that Silk Way obtained from the International Bank of Azerbaijan (IBAR), was required by the Ex-Im Bank as additional security and has been provided to our airline based on standard market terms and conditions, the airline’s rating, and without any privileges to Silk Way. In addition to the airline’s rigorous executive vetting processes, Silk Way upholds a vigilant ‘Know Your Customer’ protocol and strictly adheres to best international business practices, proactively vetting each prospective client for any potential risks or illegal activities. Silk Way’s history of corporate compliance has not only minimized risk, but also forged and strengthened business relationships across the globe. Any information to the contrary, including the inflated amount of Silk Way’s loan, is categorically false. Silk Way’s trusted team, strong worldwide partnerships and ethical, safe operations will proudly continue delivering the best services the air cargo industry has to offer to the more than 50 destinations worldwide to which we operate. What was the smear campaign and article Silk Way Airlines is referring to? “Silk Way was given contracts worth more than $400 million with the U.S. Defense Department’s Transportation Command for more than a decade,” according to Devansh Mehta of OCCRP. Silk Way transported “ammunition and other non-lethal materials” to Afghanistan as of 2005. “In addition to its relationship with the U.S. government, Silk Way Airlines has also worked as a subcontractor for the Canadian Department of National Defense, the German armed forces, and the French army,” Mehta revealed. According to the terms of the Export-Import Bank’s $419.5 million loan to Silk Way, in case of default, the loss would be repaid by the state-owned International Bank of Azerbaijan (IBA). The problem is that IBA has been “implicated in the Azerbaijani Laundromat, a massive scheme that pumped nearly $3 billion out of the country through various shell companies,” Mehta wrote. Furthermore, IBA is not in a position to guarantee the Silk Way loan, as the IBA itself declared bankruptcy in 2015, unable to pay its $3.3 billion debt! Arzu Aliyeva, Pres. Aliyev’s 21-year-old daughter in 2010, was one of the three owners of Silk Way Bank, the financial arm of Silk Way Holding. Since 2017, her name is no longer mentioned as an owner. “Silk Way Holding, also referred to as Silk Way Group (SW Group) on its website, is a conglomerate that has currently listed 11 companies in its portfolio, including the airline,” according to Mehta. Meanwhile, Zaur Akhundov had mysteriously become the 100% owner of the entire Silk Way Group in 2014. By that time, the firm and its many holdings were already worth billions of dollars, Mehta declared, based on the company’s loan guarantee application. Akhundov, 50, had held several official positions in Azerbaijan. “It is unclear how Akhundov became the owner of a billion-dollar conglomerate with more than 10 aircraft, an insurance company, a construction company, and an aircraft maintenance company, to name a few of the enterprises in the Silk Way Group,” Mehta wondered.